FILEIO with a tcm_loop SAS port on KVM x86_64 host running v2.6.34 with the new LSI Megasas 8708EM2 PPC HBA emulation into a Windows 7 x64 KVM Guest. tcm_loop is a fabric module that can emulate any supported fabric type locally for LinuxIO. tcm_loop provides full local SCSI device emulation (SPC-3 and SPC-4) for raw block storage objects. It thus makes any raw block device apear to the LinuxIO as a full SPC-3/SPC-4 SCSI compliant device with the corresponding CDB-level SAS emulation, for access from any SCSI LLD driver. tcm_loop minimizes overhead - it delivers >12 GB/s (native) and >2 GB/s (from a single KVM guest, without hardware assist) on Intel Nehalem platforms. This provides e.g., unmodified guest operating systems, such as VMware ESX or VMware vSphere, to use the full SPC-3/SPC-4 SCSI functionality on any type of local raw block storage object they require. 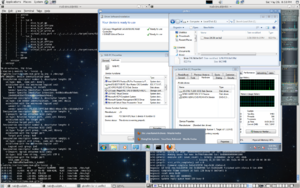 The tcm_loop fabric module (loopback.ko, Linux kernel driver database) for LIO was released with Linux kernel 2.6.39 on May 18, 2011 (2011-05-18). targetcli from Datera, Inc. is used to configure tcm_loop targets. targetcli aggregates LIO service modules via a core library, and exports them through an API, to provide a unified single-node SAN configuration shell, independently of the underlying fabric(s). 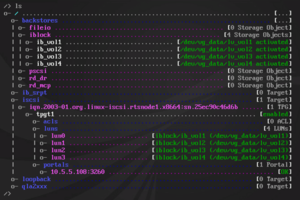 targetcli is invoked by running targetcli as root from the command prompt of the underlying LIO shell. An initial setup as described in targetcli is assumed. targetcli automatically assigns the default ID '0' to the LUN, and then changes the working context to the new LUN. Now the target is created, and exports /dev/sdb as LUN 0. Without saveconfig, the LIO configuration will be lost upon rebooting or unloading the target service, as it will revert back to the last saved one. Datera spec files define the fabric-dependent feature set, capabilities and available target ports of the specific underlying fabric. In particular, the tcm_loop spec file /var/target/fabric/loopback.spec is included via RTSlib. The type of SCSI fabric features that are available with tcm_loop (target mode emulated SAS ports) includes the complete set of SPC-3/SPC-4 logic in the LIO engine, including advanced features such as PRs, ALUA, VAAI, etc. tcm_loop supports high level fabric emulation. That is, depending on which WWN is used to create the ConfigFS group in /sys/kernel/config/target/loopback/$WWN, it configures itself to return iSCSI, FC etc. device identifiers for the SCSI LUN protocol identifiers device identifier page. This page was last modified on 7 August 2015, at 02:36.